I've been thinking about learning. Nothing new here. Usually my thought process goes to individual learning, group learning, organizational learning.... how do we make them reinforce each other Today, I'm looking at it with a different lens. I've often argued that knowledge management needs to be better embedded in the flow of work, or at least in existing processes. For example, organizations that have strong risk management processes could enhance their risk management with knowledge management, couple the two processes and avoid duplicating efforts. When we try to put new processes on top of already complex work routines, we unnecessarily decouple knowledge processes from work. The same can be said about on-the-job-learning more generally. The goal should be to enhance learning in the flow of work. To a large extent, it may already be happening and it is not getting recognized. Here is an extension of the knowledge management analogy using the famous knowledge iceberg. The knowledge iceberg is typically used to illustrate that only a small portion of our knowledge (our explicit knowledge) is visible above the surface of the ocean while most of our knowledge (tacit knowledge) is buried in our heads and difficult if not impossible to share. My little hand-drawn version of the iceberg below suggests a similar challenge with learning. Formal learning, above the water line, is visible, measurable, and can be managed by organizations. Informal learning is much less visible, not well understood, yet may contribute much more to overall learning within the organization. Formal learning tends to be managed to support work and it can be aligned with the organization's strategic objectives. Informal learning happens in the flow of work. 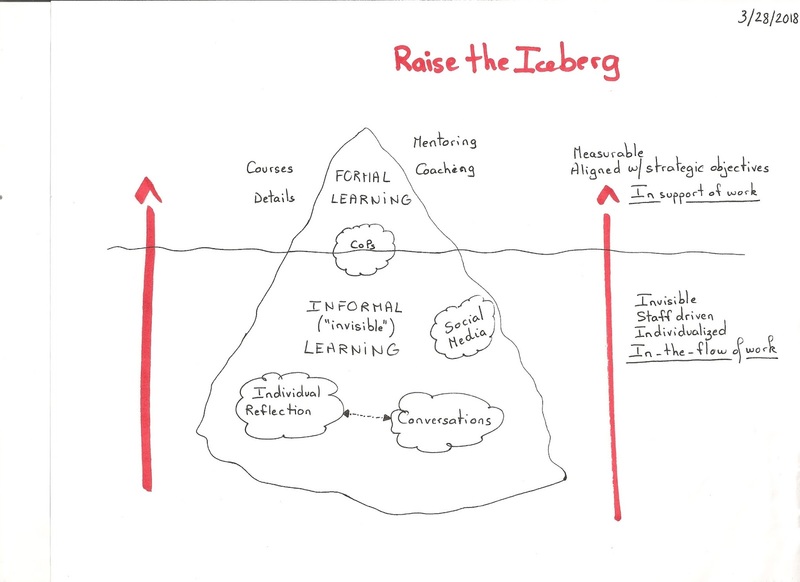 The challenge is 1) to better understand how informal learning can benefit the organization and support formal learning objectives; and 2) to raise the iceberg so that informal learning gets more visibility and the attention it deserves. I've put Communities of Practice at the ocean's surface because I see it as a way of trying to encourage and shape informal learning around topics relevant to the organization. Josh Bersin, "Learning in the Flow of Work," February 22, 2018.